The Plantar Fascia is a strong ligament-like structure under the arch of the foot that runs from the heel bone to the ball of the foot. If we could see it in isolation it has a triangular shape when looked at from underneath but has a curved shape when looked at from the side – much like a sail boat’s sail billowing in the wind. 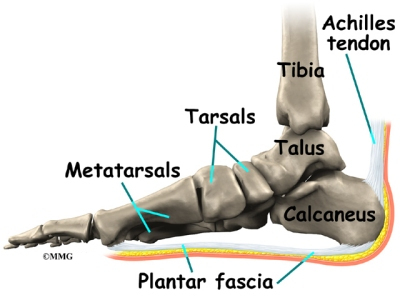 The most functional piece is from the front-bottom-inside area of the heel bone (calcaneous) to the joint of the big toe (hallux) and this is where the majority of stress of walking (and running and jumping) is taken by the fascia. How your plantar fascia reacts to and recovers from this stress is what determines the extent and nature of your plantar fasciitis. Give your painful heel lots of rest. You may need to stay completely off your foot for several days when the pain is severe. Your healthcare provider may recommend or prescribe anti-inflammatory medicines, such as aspirin or ibuprofen. These drugs decrease pain and inflammation. Adults aged 65 years and older should not take non-steroidal anti-inflammatory medicine for more than 7 days without their healthcare provider’s approval. Resting your heel on an ice pack for a few minutes several times a day can also help. Try to cushion your foot. You can do this by wearing athletic shoes, even at work, for awhile. Heel cushions can also be used. The cushions should be worn in both shoes. They are most helpful if you are overweight or an older adult. Your provider may recommend special arch supports or inserts for your shoes called orthotics, either custom-made or off the shelf. These supports can be particularly helpful if you have flat feet or high arches. Your provider may recommend an injection of a cortisone-like medicine. Lose weight if needed. A night splint may be recommended. This will keep the plantar fascia stretched while you are sleeping. Physical therapy for additional treatments may be recommended. Surgery is rarely needed.